Waterproof SUNSCREEN SPF-15 6 fl oz. What ever Buzz-Word you want to use Big Coconuts has it. 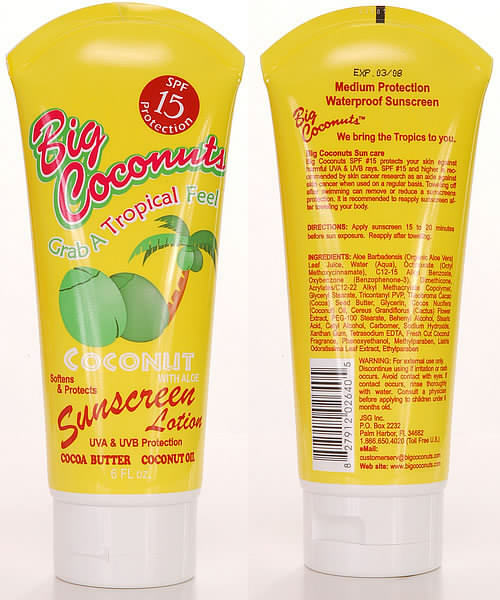 Big Coconuts SPF 15 waterproof Sunscreen is designed to protect as well as soften your skin. Enriched with Organic Aloe Vera, Cocoa butter, Coconut Oil, Cactus Flower Extract and of course our "Fresh Cut Coconut" fragrance. Our SPF-15 is of a higher standard and quality. SPF-15 and higher is recommended by the Cancer Research Center to help guard against skin cancer. Our lotion blocks both UVA and UVB sun rays with an anti-aging formula. Get the sun you want with the protection you need.